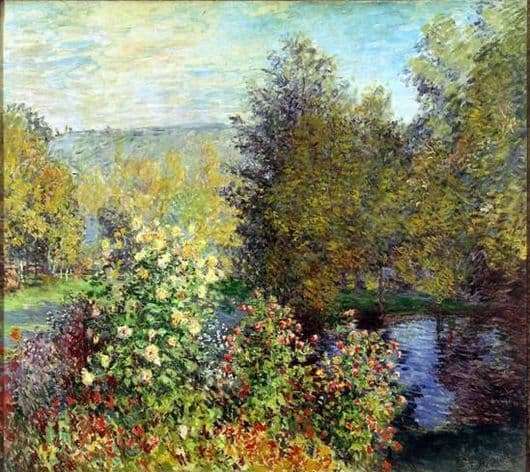 Monet’s painting “The Garden Corner in Montgeron” was painted in 1876-1877. Now it is stored in the collection funds of the State Hermitage Museum. Looking at the picture, our view opens a beautiful, quiet garden with some mysteries and riddles hidden in the undergrowth. Lush and luxurious bushes bloom bright, colors: orange-red and yellow shades. It seems that the artist applied paint in a chaotic manner. The picture is dominated by yellowish-green tones, creating the illusion of reality as if it were not a written image, but a photograph. Green shades give the garden a breath of spring and warmth. Colors seem to play with each other. They are doubled, split into shades, forming a characteristic coloring for this work. The garden is like a beautiful blooming bouquet: expressive, airy, lush. The color rendition is at the same time both realistic and expressive. Landscape, like a sketch sketch created by the artist in a short period of time. This is where the impression of impressionism, light, bright and sunny mood comes from. Maybe someone may seem that the picture lacks a bit of clarity, sharpness, due to the fact that the image is constantly in motion. It creates the impression of obscure, floating figures, mysterious and ghostly. The very light in the creation is a little dim, one might even say twilight. The picture makes the viewer the impression of peace, tranquility. There are no hassles and daily problems. This place is a real corner of calm nature and measured life, silence, kind, clean feelings and thoughts. Even the colors in the picture are light, clean and open, without any color experiments. But still can not be said that the image is too simple. Thanks to impressionism, the landscape looks real, solid and complex. In the garden there is a large variety of flowers and greenery. Garden trees occupy the main part of the landscape. Their image is fascinating, immersing the viewer in the soft comfort of their beautiful forms. Like clouds, they carry lightness and airiness, filling the whole space. At the same time, the picture is close to reality itself, sometimes even overshadowing it with its beauty and brightness.